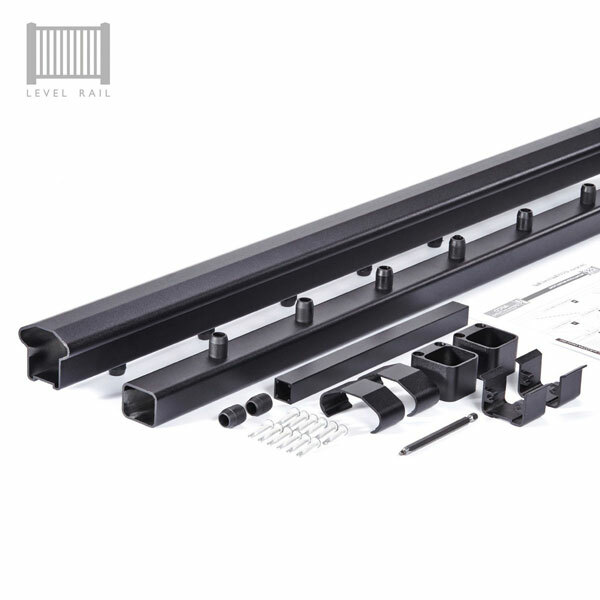 Series 100 Level Rail Kit contains the Top Rail and the Bottom Rail of the rail section. The Baluster Connectors to mount the balusters to the rails are factory installed on both the Top and Bottom Rails. To assemble the rail, simply slide the balusters over the connectors and knock the rail section tight with a rubber mallet. Also included are Two Top Rail and Two Bottom Rail Post-to-Post Mounting Brackets, Support Block Material and Hardware for mounting the rails to any AFCO Aluminum Afco-Rail Post. Please note that Balusters are not included. Series 100 Baluster Kits are sold separately. "Carefree" is the goal of your outdoors living space. Aluminum AFCO-Rail can help you meet your "carefree" goal with a virtually maintenance-free product that comes with a limited lifetime structural warranty. The robust Aluminum AFCO-Rail system is made of extruded aluminum that will never rust and exceeds IBC and IRC requirements to provide the structure you need. With seven durable, AAMA-2604 powder-coat paint finishes available for all its unique series, Aluminum AFCO-Rail can give your space the style you want.